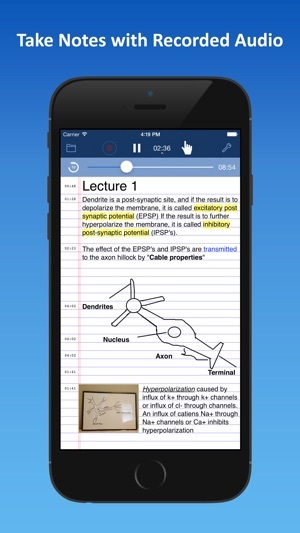 Take notes with recorded audio using the best note taking app in the App Store! 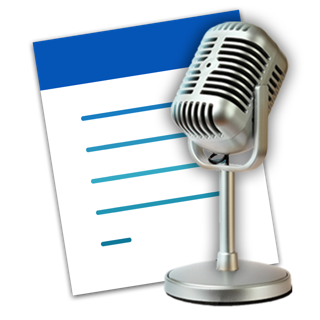 AudioNote combines the functionality of a notepad and voice recorder to create a powerful tool that will save you time while improving the quality of your notes. 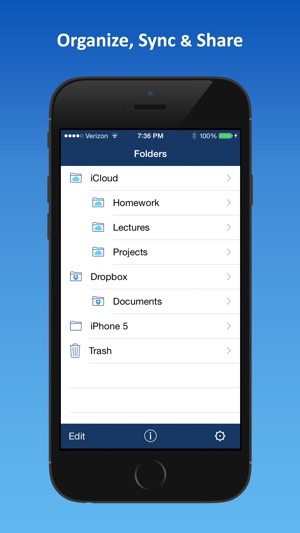 It’s the perfect app for students or business. By synchronizing notes and audio, AudioNote automatically indexes your meetings, lectures, interviews, or study sessions. Need to review the discussion about deliverables on your next project? Trying to remember what the professor had to say about a key point? 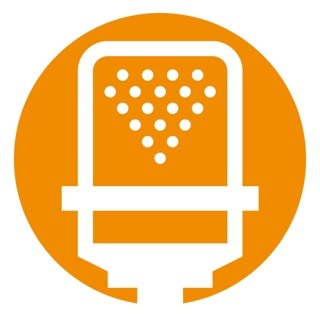 With AudioNote there is no need to waste time searching through the entire recording to find out. Each note acts as a link directly to the point at which it was recorded, taking you instantly to what you want to hear. Didn't take any notes during the meeting? No problem, you can add them later. 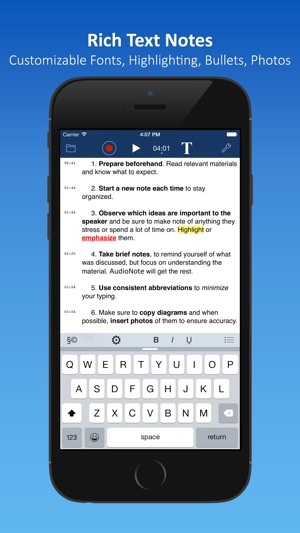 A fully functional note application, AudioNote also increases the value of your notes. Watch as your text, drawings, and photos highlight during playback, helping you to remember the context in which they were taken. With the convenience of the iPad or iPhone, you can use AudioNote anywhere: meetings, interviews, conferences, lectures, study sessions. Even use it to record memos to yourself as you jot down new ideas. Join the thousands of students, teachers, business executives, and other professionals who have already discovered what an indispensable tool AudioNote can be. Download it today! "AudioNote has one trick, and it's a doozy. 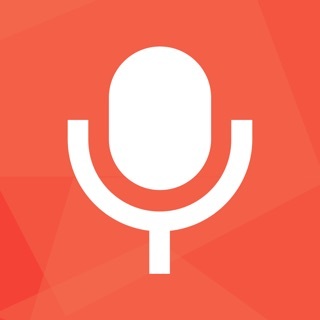 Aside from functioning as a basic note-taking app, AudioNote can make sound recordings at the same time, and keep them synchronized, note by note, with the text. You can, in effect, relive a lecture or a meeting through sound and notes." 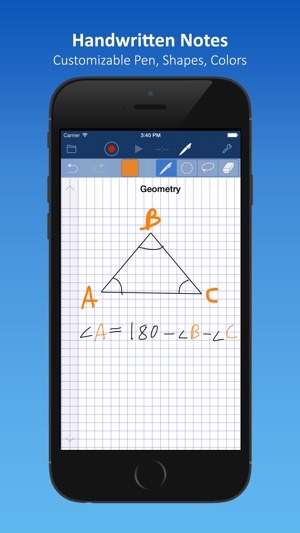 "The best note taking application out there!" "I've been looking for a note taking program. Tried several. This is the best by far." "GREAT JOB, use this for all my meetings!" "This program is sooooooo useful. ... I would recommend this to ANY student for any lectures." Still not convinced? Try AudioNote LITE for free! 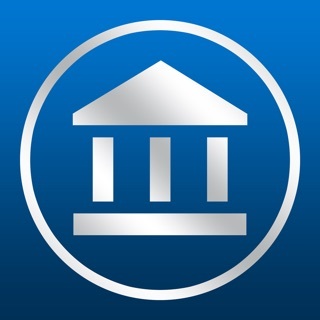 This app is exactly what I needed for scripting conferences, observations, and evaluations. 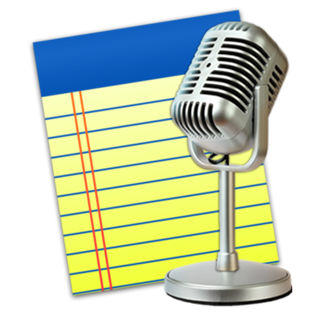 The audio recording option as notes are being taken makes sure you do not miss anything. The audio is of excellent quality, even if someone is across the room speaking. The functionality of the text options along with the easily imported pictures and other graphics make it even better. It is also beyond user friendly!! I am no tech guru, but I use the options with ease!! The only other thing that could make it even more perfect would be the option to record video as notes are being taken. Oh, well...I love it as is!!! I have this app on my older iPad mini (version 9.3.5) and it is great. However, on my newer iPad mini 4 the list of lectures overlap each other in enormous font and I can’t find and tap on the one I want to listen to. So I uninstalled it which meant losing everything. I then reinstalled it again, but after recording a few new discourses it still is doing the same thing. Why does it work perfectly on one device but is such a disappointment on the newer one? Can it be fixed? Been using to take class notes. The only note taker that can place your audio notes right where u are writing. Some suggestions. 1. Need paper line separation options..The lined paper on my iPad Pro 10.5 is way too small to write in. 2. Pen width options. The ink on my iPad when writing is way to think n wide. This should be an option for users. 3. Pressure sensitivity. The new iPad and pencil have pressure sensitivity. It should be incorporated in here.